"Finalist of the "Entrepreneur of the year" Kingston Business Awards 2011"
If regular cleaning is not undertaken then greasy deposits left in the ductwork will attract fibrous build-ups as time progresses, will become baked on, making removal extremely difficult and time consuming. Air flow efficiency can be seriously impaired by deposits, leading to a greater use of energy. All areas which if not regularly, professionally, cleaned and maintained can quickly become a fire risk. Bacteria developing in grease deposits create a hazard to health. Business efficiency and profitability are also bound to suffer. Neglect of grease extractors results in the accumulation of fats, oily deposits and fibrous particles in the system, the major cause of the spread of fire in catering establishments. The warm greasy environment is an ideal breeding ground for bacteria and cockroaches. Failure to ensure regular cleaning of kitchen grease extract systems can invalidate buildings insurance cover. We are aware of many cases where insurers are refusing to pay out on millions of pound worth of claims following fires where the insured has not complied with the warranties on their buildings insurance policies regarding regular cleaning of the grease extract systems. Advanced Professional Catering Services can provide service contracts and any type of ducting services for your peace of mind. 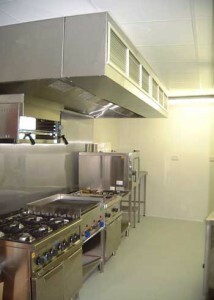 Extraction System ensures that kitchen grease extract systems (canopies, filters, ductwork, risers and fans) in kitchens, restaurants, hotels, pubs, canteens, food production areas, hospitals, schools and the like are cleaned as required by your buildings insurance policies, in accordance with Fire Safety Regulations and Workplace (Health, Safety & Welfare) regulations. - Fans and Filters replacement. - Stainless steel bespoke canopies design and installation. - Many sections of your heating and cooling system may not be accessible for a visible inspection, so ask the service provider to show you any mold they say exists. - You should be aware that although a substance may look like mold, a positive determination of whether it is mold or not can be made only by an expert and may require laboratory analysis for final confirmation. - If you have insulated air ducts and the insulation gets wet or moldy it cannot be effectively cleaned and should be removed and replaced. - If the conditions causing the mold growth in the first place are not corrected, mold growth will recur. - Ducts are clogged with excessive amounts of dust and debris and/or particles are actually released into the home from your supply registers.